These are just a few examples of children we have helped during the summer at our school. These will give you a good idea of the standards of English and age ranges that we can help, as well as an idea of the special attention that each of our children receive during their lessons and courses with XUK. Two 16 and 17 year old Greek girls, who were almost fluent, wanted to come to the UK to prepare for their proficiency exam. We were able to ensure the girls had suitably experienced teachers to ensure they got maximum benefit from their time with us. The girls found that the range of accents and friendliness of the staff helped them take their language to the next level. 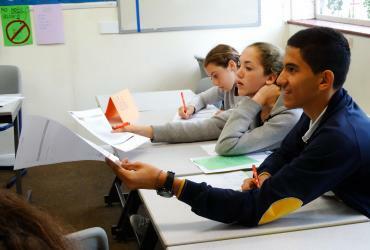 They learned many idioms from all regions and improved their listening skills considerably. Our youngest student in 2011 was a girl from China. This was the first time that she (and her sister) had been to Europe and was a big responsibility for us as well as a big challenge for her. A 12 year old boy came to the camp for four weeks, for one reason - to pass the exams required by International Schools, which he has failed by some margin prior to the summer. He undertook a course of additional Maths and English lessons at XUK English and ended up passing with flying colours - a spectacular turnaround. His new headmaster said he had never in his life seen such a rapid improvement in performance and he talked of ‘miracles’, all of which was testament to the time our experienced staff spent on both technique and confidence. An 11 year old girl and her older brother, from Switzerland, were one of our few day campers at XUK English. They combined a family holiday with a stay for their children at XUK English. Our flexibility enabled them to have lessons with us in the morning and spend as much time with us in the afternoons and evenings as they and their family chose. She arrived in the UK being able to speak little or no English, but after just a week, was able to communicate basic ideas and thoughts.